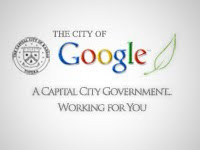 City renames itself to Google – ¿¡ tjongolongo ?! The city of Topeka, Kansas in United States has changed its name to Google, Kansas for the next month. By changing the name they are hoping to be chosen by Google for Google’s broadband experiment. Tjongolongo, how weird is that! An entire city that what’s to be part of an experiment so badly it decides to change its name! I think that this is a nice example of the influence Google has on people. Google’s Communications department has done an excellent job. They have been able to influence Google’s reputation by not only saying things about the Google, but also showing it. Everything Google does is in a Google way, from the way they built their offices to the way the push out new products. Over the years Google has gotten into the minds of people in a positive way. In Topeka, Kansas they have even gotten one resident, 26-year-old Jared Starkey so positive about Google and its new service that he decided to suggest to change the town’s name to Google. Not only has he done that he has also started the website ‘Think Big Topeka‘ as well as organize a flash mob and start a Facebook fan page to get Google’s Fiber Experiment to Topeka. I think it’s great to see the effort a city is putting in to get chosen by Google. I’ve read that other cities have also started fan pages, but I haven’t heard of one changing its name to get Google’s attention! I wish Google, Kansas, formerly known as Topeka, Kansas, all the best in their challenge to be one of the ‘chosen ones’. Do you think Google, Kansas will be one of the chosen few?